One of the most sophisticated and widely used models for portfolio returns estimation and asset allocation is the Black-Litterman Bayesian asset allocation model. The Black-Litterman model was developed by Fischer Black and Robert Litterman at Goldman Sachs in the early 1990s. The Black-Litterman model is designed to overcome the main weaknesses with Markowitz Mean-Variance optimization: namely that the traditional method of estimating asset returns in isolation both from other assets and from the market as a whole usually leads to portfolios highly concentrated in a few assets -- ie lacking diversification. Asset portfolio weights are very sensitive to even small changes in return estimates and this leads to portfolios which are risky and impractical to implement. The Starting point for the Black-Litterman model is a portfolio with assets weighted according to their market capitalizations. Reverse optimization is used to back out the returns implied by the market weightings. These equilibrium expected returns -- the market neutral reference point -- are combined with user "views" about the absolute or relative performance of selected asset classes/sectors to produce revised ("blended") estimates of returns. Revised estimated returns are then used to produce an optimal portfolio and, if required, an efficient frontier using the Hoadley Portfolio Optimizer. Using the Black-Litterman model leads to well diversified portfolios which avoid extreme long/short positions, and the wild swings in asset allocation weights which you normally get from MVO when asset returns are changed, even slightly, in isolation. And importantly, the Black-Litterman model achieves this diversification without the need to impose tight arbitrary constraints on asset weights during portfolio optimization. The Black-Litterman model can be used for asset allocation, where "assets" are defined in terms of asset classes/sectors/countries etc. or for individual security selection. Whilst the principles for both asset allocation and security selection are the same, the Black-Litterman model is usually used for asset allocation using 8-20 asset rather than for allocating weights across a large number of individual securities within a portfolio. The Black-Litterman model is not an alternative to MVO but is complementary to it. Black-Litterman and MVO are usually used together. The Hoadley Black-Litterman Returns Estimator is an Excel-based software application that can be used by investors to estimate returns and allocate assets using the Black-Litterman model. The interactive nature of the application is designed to facilitate rapid scenario development and prototyping. Estimating market equilibrium returns using reverse optimization. The inputs required are estimates of asset market weightings, volatilities and correlations, and an estimate of the overall "market" risk premium or return. Individual asset returns are then backed out using reverse optimization. 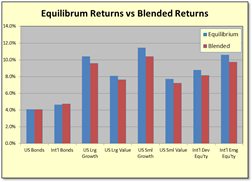 Blending equilibrium returns with user views: User views about the absolute or relative returns of individual assets or asset groups are combined with the equilibrium (ie market implied) returns to produce a revised set of "blended" returns. 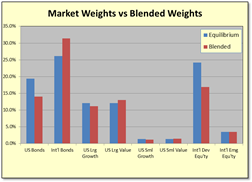 Calculating optimal portfolio weights: The blended returns are then used to produce the optimal portfolio weights (ie which maximize the Sharpe ratio). Flexibility in specifying user views: Views can be specified as absolute (eg "The return on US bonds will be 4.5% pa (80% confident)" or as relative (eg "US small caps and US large caps as a group will out-perform equities in international developed markets and emerging markets by 1% (50% confident)". Graphical representation of returns and portfolio weights: Original (equilibrium) returns and blended returns are shown side by side on one chart. Market weights and optimal portfolio weights incorporating user views are similarly brought together on a single chart. As user views are being entered and adjusted, the blended returns and optimal portfolio charts are updated dynamically. Views about future performance of individual assets or asset groupings can be switched on or off by checking/un-checking check-boxes to enable the impact of various combinations of views to be easily assessed. Integration with the Hoadley Portfolio Optimizer: Data can be exported to the Hoadley Portfolio Optimizer with one button click for the production of an efficient frontier, possibly with asset constraints, and additional advanced analytics. The Hoadley Black-Litterman application uses the Black-Litterman functions from the Hoadley Finance Add-in for Excel as the calculation engine. The software application provides a convenient alternative to using the Black-Litterman functions directly. The application's VBA source code is not password protected and as such can be used as an example of how to develop Excel-applications based on the Finance Add-in for Excel. The Hoadley Black-Litterman Returns Estimator application is included in the price of the Finance Add-in for Excel. When purchased under a private/personal license the number of assets that can be handled by the Black-Litterman functions is capped at ten. To handle more than ten assets a corporate/commercial license is required for businesses (Commercial licensing enquiries) or a "Pro" license upgrade for approved private investors ("Pro" licensing enquiries). This application requires Microsoft Excel (32-bit or 64-bit) running under Microsoft Windows. For detailed systems requirements, including supported versions of Windows and Excel see systems requirements. The Hoadley Black-Litterman Returns Estimator is available for download to users who have purchased the Hoadley Finance Add-in for Excel and are still within their one year free download period.